Celebrating the 12th edition of its flagship Arab Startup Competition (ASC), MIT Enterprise Forum Pan Arab launched, in close collaboration with Roland Berger, a comprehensive report to assess the Forum’s instrumental role in empowering startups and fostering an ecosystem of entrepreneurship and innovation. The report was launched during the tech conference and award ceremony of the competition’s 12th edition, which took place in Beirut on March 29. The event attracted a crowd of 900 + entrepreneurs, judges, mentors, partners, media, startup and tech enthusiasts, and more. From a humble beginning in 2006, the competition has grown into one of the most impactful startup programs in the Arab world and the biggest in terms of the number of applicants, quality of participating startups and ideas, and the community of partners, judges, and mentors involved. ASC's first edition attracted 247 fully submitted applications, a number that has increased steadily over the years to reach approximately 1,000 fully submitted applications per year – 21% annual growth year-on-year. Founders hailed from all Arab world countries, with an estimated 60% of the applications coming from Egyptian, Lebanese, Saudi Arabian and Jordanian founders. Running the program for over a decade has brought forth a tremendous amount of data that, when studied, provides insights on multiple aspects. During the past years, and comparing the locations, demographics and areas of interests of the entrepreneurs, few trends have been observed. This is why we have conducted an extensive survey over the course of 2 months and collected feedback and data from a selection of startups that took part of ASC. With the support of our knowledge partner, we carefully studied the impact of the competition on startups and their impact in return on the Arab macroeconomy. The study also allowed us to look into women participation, recent industry trends, and current emerging startup hubs. The report proudly boasts a contribution worth of 415 million USD to Arab macroeconomy by the startups that evolved throughout the Arab Startup Competition and an astounding 14,000 newly created job opportunities. Entrepreneurs have also reported that the employment figures increased post ASC. Although there may be different factors behind this increase, it can be assumed that it was driven by the expansion of the startups' operations and network effects from the increased exposure gained through ASC. As the entrepreneurship ecosystem in the region matures, it is anticipated that not only will the number of jobs created increase, but their quality and sustainability will also rise. The study observes an increased participation of female founders and team members. More women are among the participants and winners, highlighting a stronger female leadership in the entrepreneurship ecosystem. 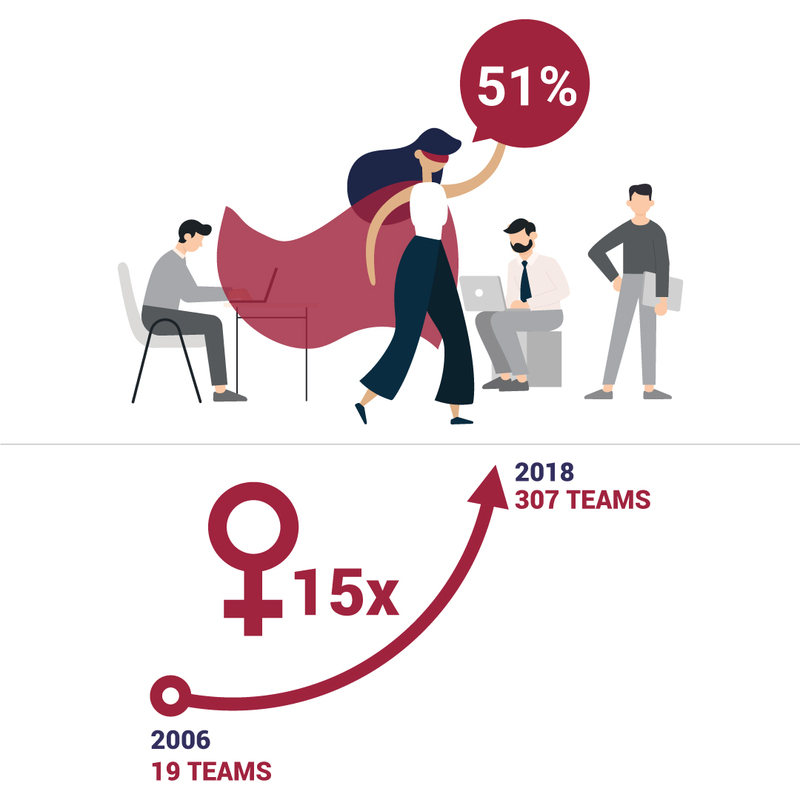 We are proud to announce that 51% of the semifinalist teams have had at least one female member with a leading role, and an astonishing 48% of the winners across 11 editions are female led. The report observes new areas of interest gaining momentum. Startups that operate in digital and emerging technologies have risen in the last few years. In 2010, startups in Fintech, Digital technology and E-commerce, and Cyber Security started to emerge to account for 3% of the total number of applications received by ASC. This year, these startups account for 32% of the total applications received. Greentech is on the rise, with a noticeable average annual increase of 24% in startups and ideas falling under Energy, Environment Services and Water/Green Technology. The report also introduces the Arab Entrepreneurship Maturity Index (AEMI), a blended index that evaluates the entrepreneurship ecosystem of each Arab country, focusing on 6 critical pillars: local infrastructure, human capital, know-how, financing, business set-up, and business operations. The index leverages on publicly available data to provide a holistic view of the ecosystem, highlighting the overall attractiveness and ease of setting up and operating businesses across the MENA region. The figure below shows that countries from the Gulf Cooperation Council (GCC) are top performers, with the UAE attaining an astounding 3.8 overall score (out of 5.0), due to its ease of setting up businesses and the robust local infrastructure. The report and its remarkable results come as a restatement of MITEF Pan Arab’s commitment to further expand its impact moving forward. The Forum’s ambitions for the Arab entrepreneurship ecosystem are limitless. While the success of the ecosystem depends on the collective efforts of all stakeholders and institutions involved, MITEF Pan Arab is committed to shaping and supporting the building blocks of entrepreneurship in the Arab World.